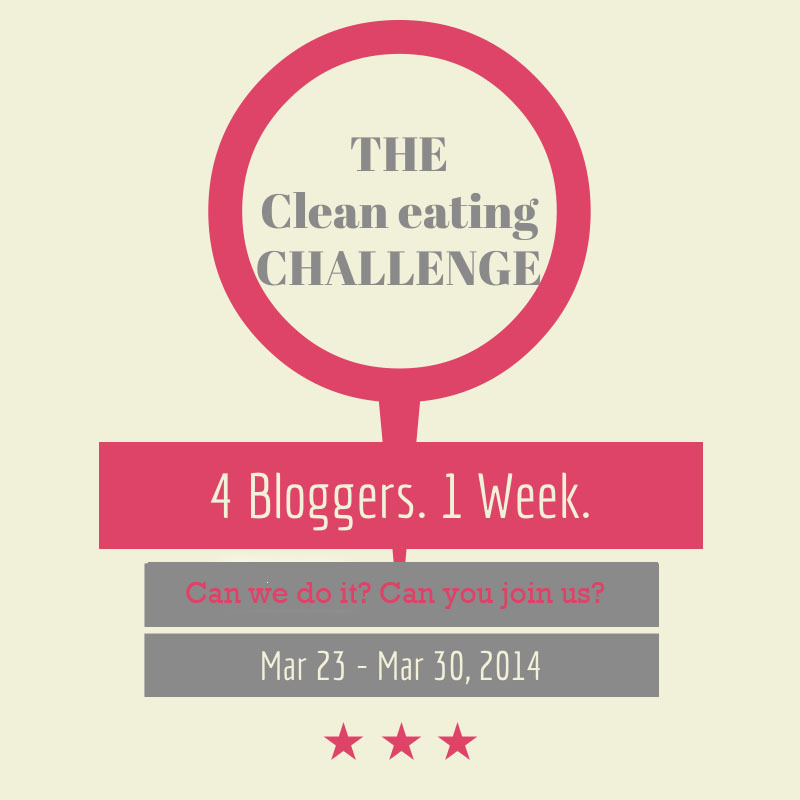 Browse: Home » 2014 » March » Clean Eating Challenge Kick-off: Let the Cravings Begin! Well, it’s here. The first day of the Clean Eating Challenge. As I mentioned Friday, I inadvertently got myself into this, but I’m glad I did. While my eating habits are generally pretty healthy, they could definitely use some spring cleaning. Let me give you an idea of my typical day. So, yeah. There’s room for improvement. It’s a good time for a Clean Eating Challenge. “Clean eating” is sort of a nebulous term. I’m not planning on doing anything as drastic as that detox I attempted last year (no meat, wheat, dairy, sugar, caffeine, alcohol). Because while a detox has its benefits, I’m more interested in making a few reasonable adjustments to my existing diet. So I’ll be fine-tuning recipes I normally make. And obviously, I’ll be cutting quite a few things out. 1) Refined grains and sugars. Goodbye sugar, white rice and pasta, etc. I will allow myself whole wheat pasta, brown rice and sweeteners like raw honey and maple syrup in moderation. 2) Processed foods. Out goes anything with more than five ingredients on the label, or ingredients that I can’t pronounce or don’t have in my own kitchen. For example, all those meat substitutes. Yes, they make my life simpler. But this week, I’m going to try to find “whole food” substitutes for my substitutes. Tofu, tempeh, seitan etc. are still allowed. 3) Alcohol and excessive coffee. I don’t think there’s anything wrong with either of these in moderation, but for the sake of the Clean Eating Challenge, I’m going to cut back. There’s no question that the sugar is going to be the hardest thing for me to cut. I love, love, love baked goods, ice cream, and anything chocolate. I turn to them to make me feel better when I’m stressed, or to treat myself with when I have something to celebrate (e.g., two hours to myself). I expect to get many of my recipes from Mark Bittman’s The Food Matters Cook Book, which I’ve referenced here before. I will also go back to some of the recipes I learned from Michelle Pfennighaus at Find Your Balance. Finally, I’m going crazy on my new friend Pinterest. I’ve started a Clean Eating Challenge board, so feel free to check out what I’ve found and share any of your favorite “clean” recipes with me. The good news is that I’m not doing it alone: my “Partners in Clean,” as Allie dubbed us, also include Allison and Holly. We each have slightly different goals. And we’ll be cross-posting updates on our challenge this week, so you can read about their adventures, too (and not just have to read five straight days of me crying out for a hot fudge sundae.) If you’re Twittery, we’ll also be sharing updates there with #cleaneatingchallenge. Please send me your good “clean” vibes (“dirty” vibes are fine, too, as long as they don’t contain any refined sugars) and any tips or recipe ideas. Or maybe even consider joining us in the challenge for the week. If I can do it, anyone can. Commandment #4: Cook most days (or, man vs. garbanzo bean) Clean Eating Challenge: Day 4 Clean Eating Challenge: Day 5 – Almost There! Honored to a partner in clean. My issue will be salty, fried. And yeah, totally “really” starting tomorrow. PS Nosh is WORTH IT. Great post. I love your “the kids are finally asleep celebration!” I started a couple of days ago – because I fear family/spring break is going to mess me up next weekend. As I feared, I’m a little hungry with out my processed carbs, though. Thanks, guys! I’m so glad to get to “meet” you through this and have support along the way. U can try raw agave nectar as a natural sweetener as well. I started using it when I ‘went raw’ for a month a few years ago and I still use it. I am inspired and going to try to minimize sugar this week! Thanks for the tip. Sadie! Good luck in cutting back on sugar. I’m really craving my post-lunch treat at this moment.